68 Landscape Architect and Specifier News Cloonan, whose company will celebrate 25 years of business in 2016, said he wanted this tree to look like some of the sprawling, massively large oaks found in the South. The trunk weighs 1,400 pounds, and the branch that the swing is suspended from weighs 1,100 pounds. 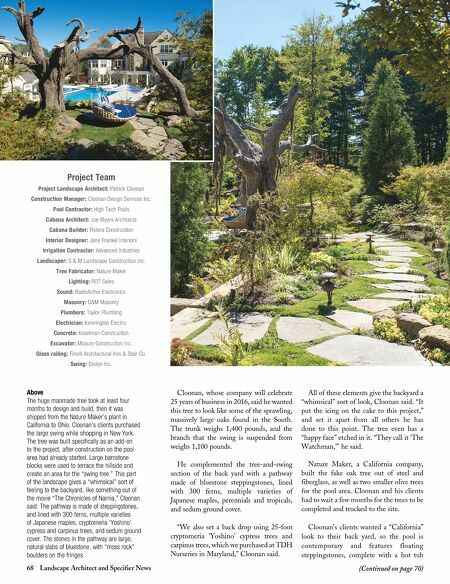 He complemented the tree-and-swing section of the back yard with a pathway made of bluestone steppingstones, lined with 300 ferns, multiple varieties of Japanese maples, perennials and tropicals, and sedum ground cover. "We also set a back drop using 25-foot cryptomeria 'Yoshino' cypress trees and carpinus trees, which we purchased at TDH Nurseries in Maryland," Cloonan said. All of these elements give the backyard a "whimsical" sort of look, Cloonan said. "It put the icing on the cake to this project," and set it apart from all others he has done to this point. The tree even has a "happy face" etched in it. "They call it 'The Watchman,'" he said. Nature Maker, a California company, built the fake oak tree out of steel and fiberglass, as well as two smaller olive trees for the pool area. Cloonan and his clients had to wait a few months for the trees to be completed and trucked to the site. Cloonan's clients wanted a "California" look to their back yard, so the pool is contemporary and features floating Above The huge manmade tree took at least four months to design and build, then it was shipped from the Nature Maker's plant in California to Ohio. Cloonan's clients purchased the large swing while shopping in New York. 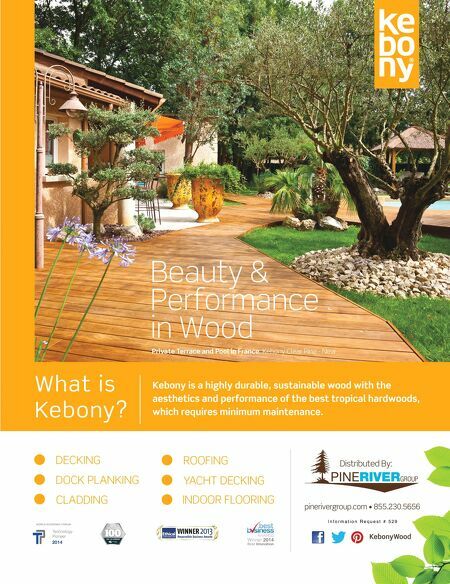 The tree was built specifically as an add-on to the project, after construction on the pool area had already started. Large barnstone blocks were used to terrace the hillside and create an area for the "swing tree." This part of the landscape gives a "whimsical" sort of feeling to the backyard, like something out of the movie "The Chronicles of Narnia," Cloonan said. The pathway is made of steppingstones, and lined with 300 ferns, multiple varieties of Japanese maples, cryptomeria 'Yoshino' cypress and carpinus trees, and sedum ground cover. The stones in the pathway are large, natural slabs of bluestone, with "moss rock" boulders on the fringes. (Continued on page 70) Project Team Project Landscape Architect: Patrick Cloonan Construction Manager: Cloonan Design Services Inc. Pool Contractor: High Tech Pools Cabana Architect: Joe Myers Architects Cabana Builder: Riviera Construction Interior Designer: Jane Frankel Interiors Landscaper: S & M Landscape Construction Inc. Tree Fabricator: Nature Maker Lighting: RDT Sales Sound: RadioActive Electronics Masonry: D&M Masonry Plumbers: Taylor Plumbing Electrician: Kennington Electric Concrete: Keselman Construction Excavator: Moauro Construction Inc. Glass railing: Finelli Architectural Iron & Stair Co. Swing: Dedon Inc.